In the lead up to the Olympics there has been a lot of discussion about the Great Britain team and the inclusion of players from Wales, Scotland and Ireland in the British squad. Ryan Giggs and Craig Bellamy have been mentioned as potential members of the team but Chester’s own Welshman, Queensferry-born Grenville Millington, has already beaten them to it having been part of the British squad that played in Bulgaria in a qualifier for the 1972 Munich Olympics. For the games the British team played Bulgaria in a two-legged qualifying game. The first leg was played at Wembley with Britain winning by a single goal but Grenville was not involved. However he was selected for the return leg in Sofia and featured for the Olympic team in two friendlies including a match against Motherwell. “I was disappointed not to be in the squad for the home leg and I’m not sure how the Olympic selectors found their way to Rhyl from London to see me for the second game. It was fantastic for me to be involved though. I’d never flown before and it was the first time I had been out of the country. The ground in Sofia was packed because it was their main team and with Great Britain winning the first game it added to the atmosphere. I think they had been expected to win in England. After Grenville’s brief flirtation with Olympic glory he returned to Rhyl and then went to Brighton and Hove Albion on trial. The rest is history and Grenville went on to play more than 300 games at Sealand Road until 1983. As for the Great Britain Olympic team. 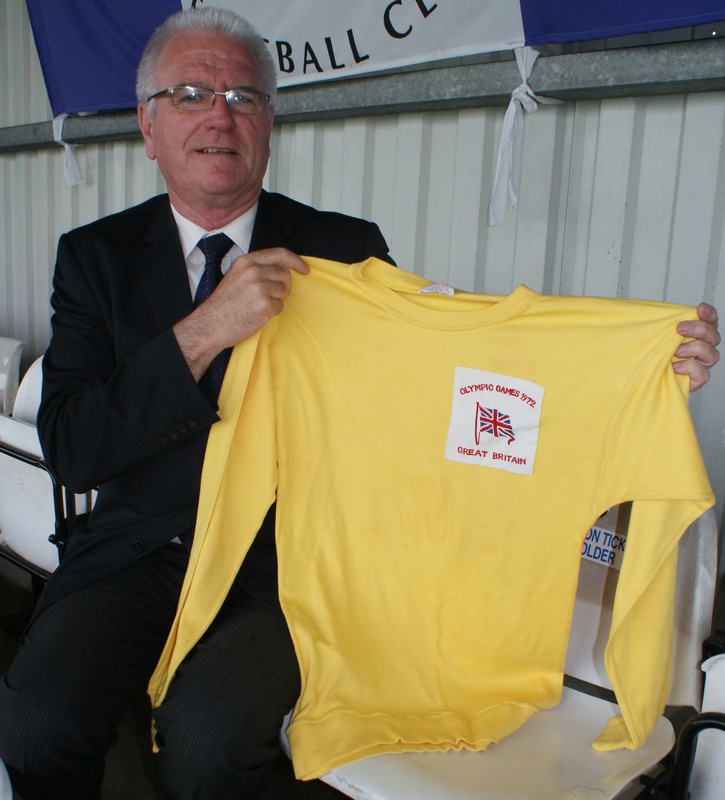 The early 1970s marked the dying days of amateur football in this country and the distinction between true amateurs and professionals was removed in 1974. For Britain this meant that the Munich games were the last occasion that the FA entered a football team for the competition. 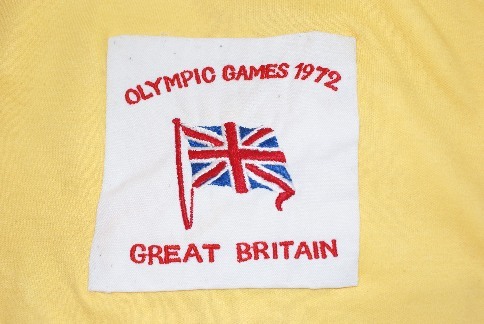 With the London games only weeks away, and Britain entering a team for the first time in 40 years, it’s nice to know that Chester has some connection to the event. I’ll be writing about an even stronger Olympic link in another article. 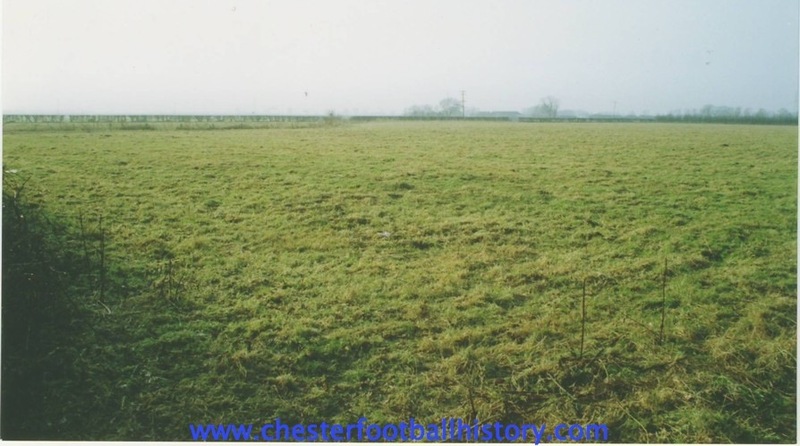 It’s 20 years this year since the Deva Stadium was constructed with the £3 million ground completed in a mere 30 weeks. 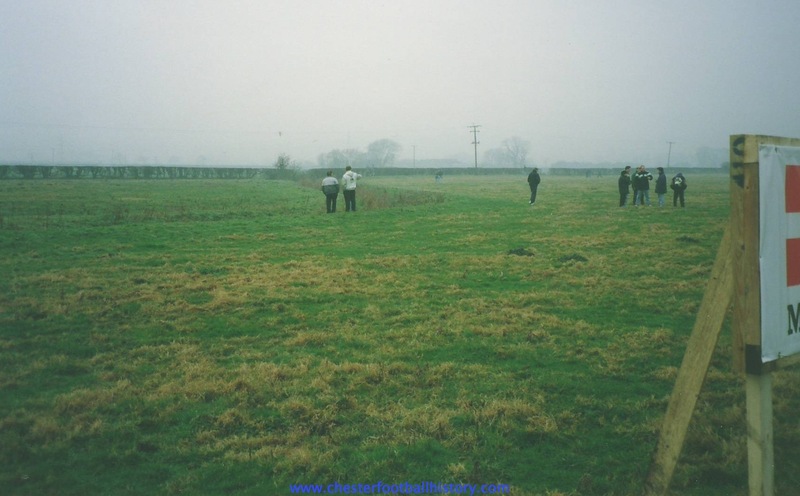 The first game took place on August 25th 1992, against Stockport County, in the Coca Cola League Cup and I have recollections of a chaotic opening night with reports of wet paint and club operations being run from portakabins in the car park. No-one could ever call the Deva Stadium the most attractive ground in the country and at best it can be described as functional but after 20 years it does seem to have finally developed its own character and now feels as comfortable as an old shoe. I still think it must be the only ground in the country with its own micro-climate as a howling gale invariable sweeps the stadium on match day as the rest of the city experiences a zen-like calm. One of the problems has always been the low capacity and it’s a shame that the proposals for a more practical 10,000 stadium couldn’t be implemented. Granted attendances may not have reached this level but at least it would have given more flexibility and reduced congestion when the ground reached more than two-thirds full. Remember Preston , Stockport and Scarborough? When the subject of a move to the end of Bumpers Lane first arose in the latter half of the 1980s various pie in the sky proposals were put forward. The most ambitious being a 15,000-20,000 capacity ground as part of a sports complex with restaurant, leisure centre and athletics track. Gradually this was scaled down until the tight timescales meant we ended up with the basic 6,000 stadium we have today. Bearing in mind the current requirements for training facilities it’s interesting to note that one of the initial planning applications from developers Morrisons included two practice pitches occupying half the current car park area. This was rejected by the council who offered the land at a low rent on the condition that stringent parking criteria were met. 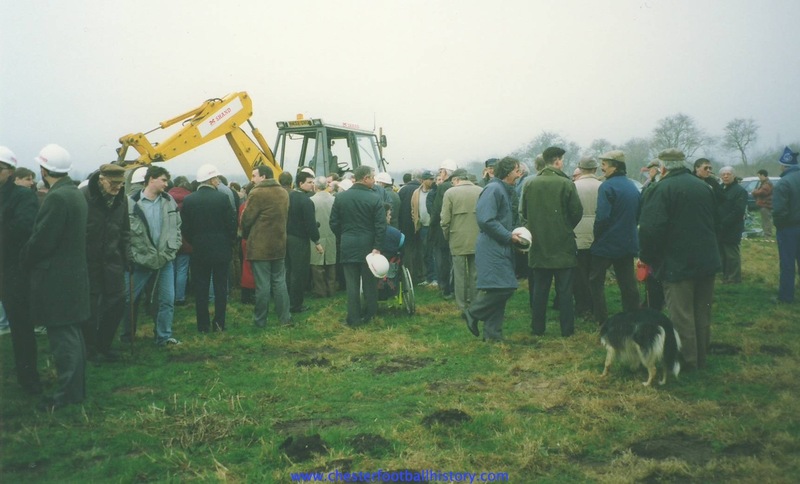 Over the next few weeks I intend posting a series of photographs showing the building of the ground which started on January 28th 1992 with a turf-cutting ceremony. 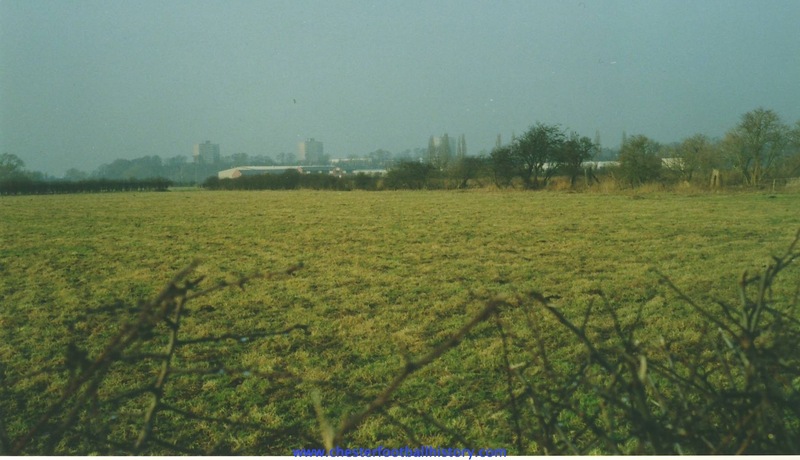 The first four photographs were actually taken as far back as February 1991 when the prolonged political machinations were still ongoing and no firm planning application had been approved. 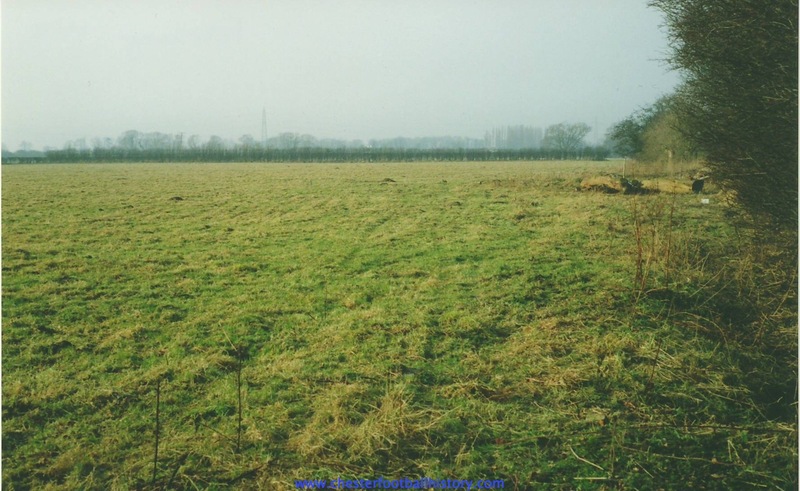 All four were taken from the end of Bumpers Lane looking towards Blacon and Sealand. 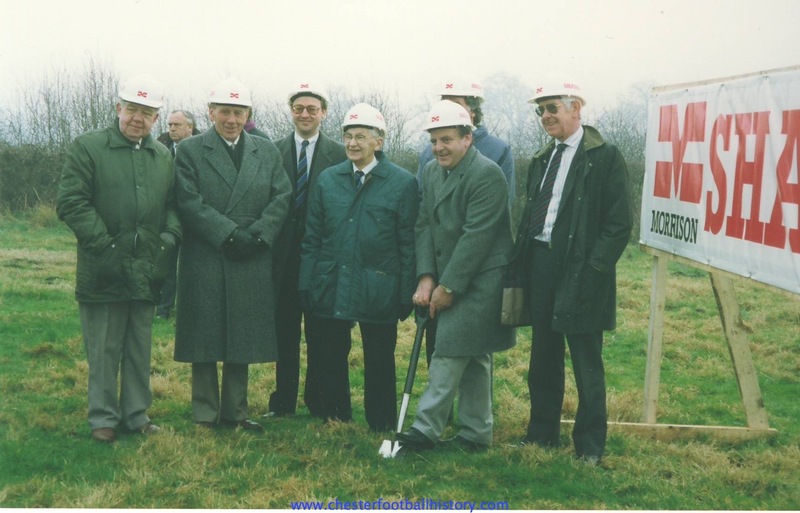 The second set of photographs were taken 12 months later at the turf-cutting ceremony. 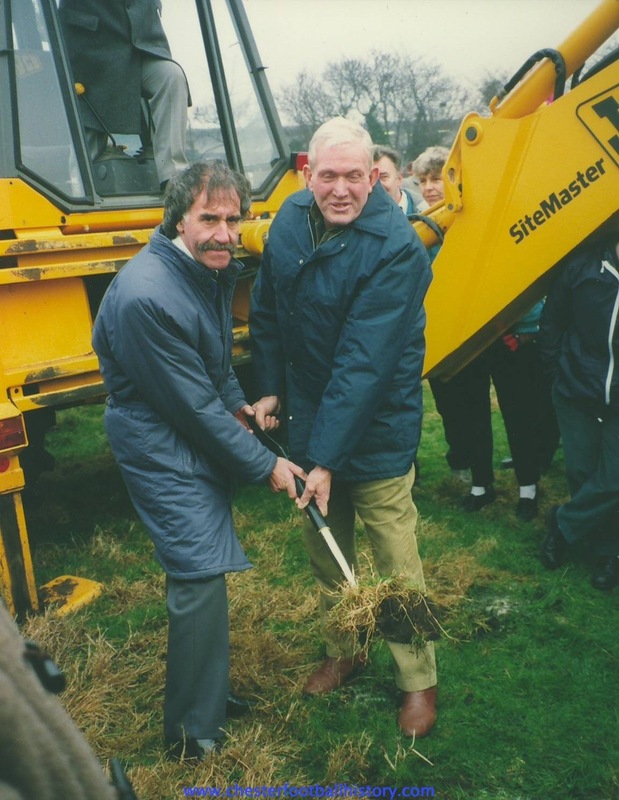 Harry McNally digs the first sod with Les Perry from Blacon who won the special draw to make the first cut. The cause of the drainage problems at the corner of the away end? The ceremony was attended by more than 200 fans but the drama was still not over as an angry city council claimed that the whole event had been held on the land without permission as the rental agreement remained unsigned. 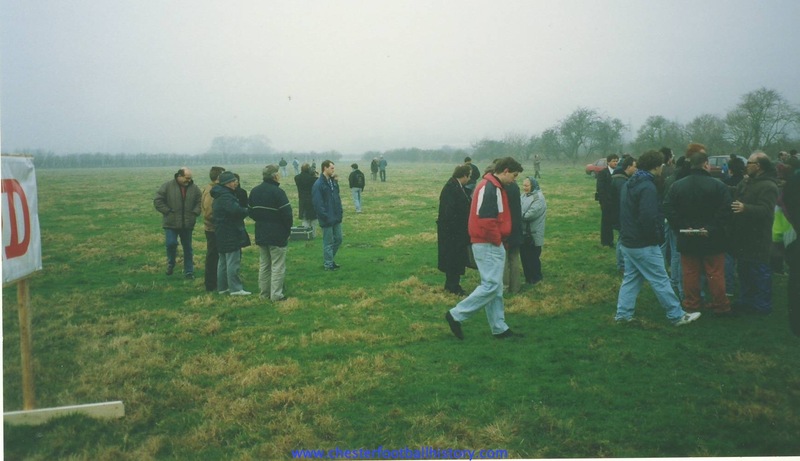 The council were particularly annoyed that Morrison’s had started to move equipment on to the land and peg out the site and they only allowed the event to take place so as not to disappoint fans that had turned up. 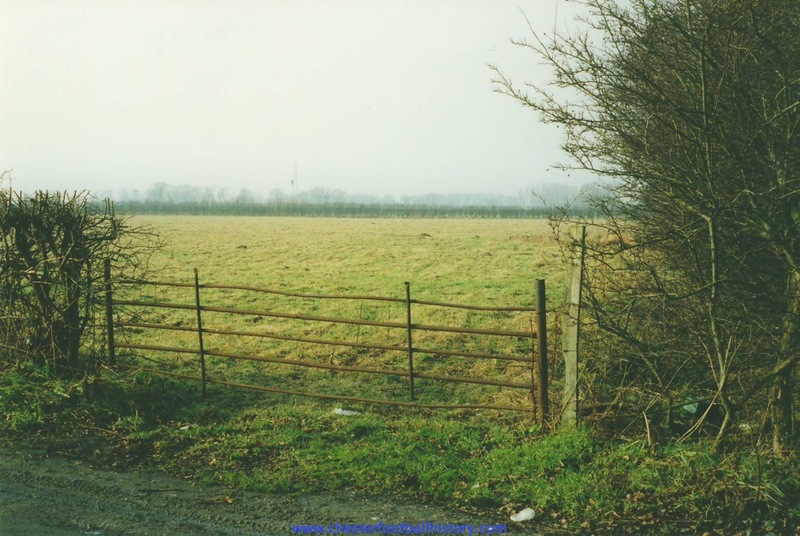 As a result an injunction was issued preventing any further work and the builders were evicted from the land immediately after the ceremony. Fortunately the problems were quickly ironed out and construction started for a second time on February 3rd. Morrison’s themselves were desperate to get the ground completed as quickly as possible as they risked forfeiting a £500,000 bond left with the Football League if the new stadium was not completed by the start of the 1992/93 season. 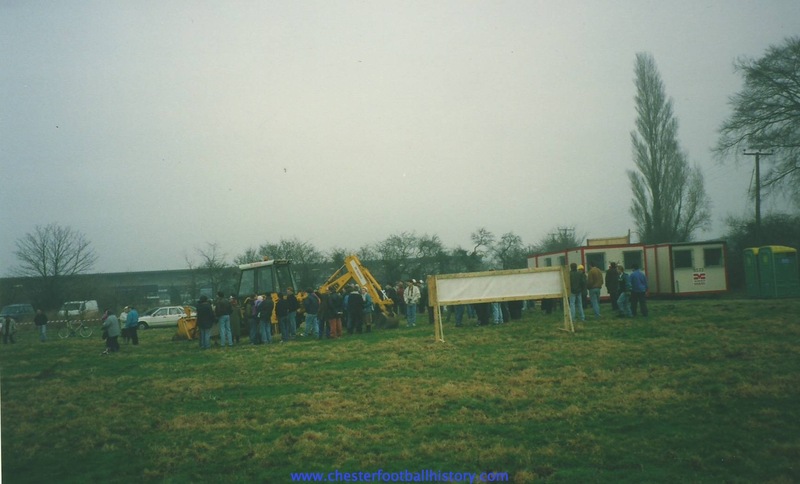 Construction moved swiftly on what was by now a very basic ground and many supporters regularly made the journey down Bumpers Lane, past the decaying skeleton of the Sealand Road ground, to take photographs of the new structure. Meanwhile, 40 miles away in Macclesfield, Harry McNally performed miracles by dragging the Blues away from a seemingly impossible situation in the third tier relegation zone. I’ll post some more photos of the construction over the next few weeks. If anyone else has any interesting photos of the ground building please get in touch.